Brain cancer and brain tumours can be significantly different in children than in adults, and may require different treatment. Read more about paediatric brain tumours below. 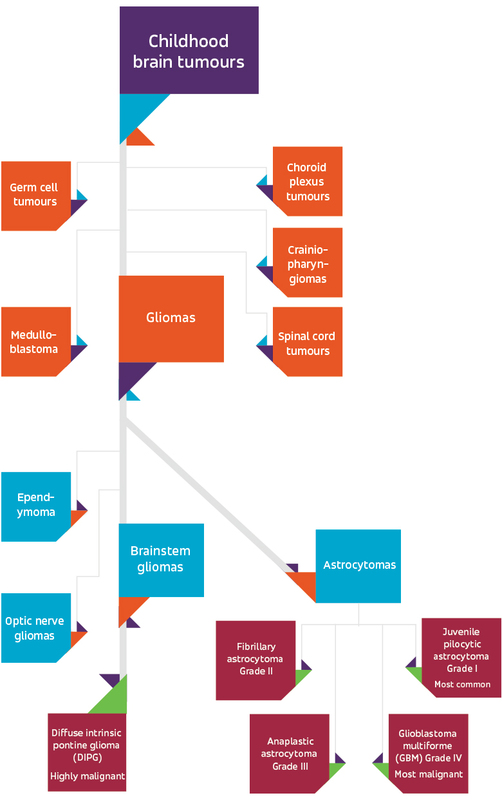 Brain tumours are the most common form of solid tumours among children. Brain cancer (or malignant brain tumours) kill more children in Australia than any other disease. Read more about the figures and statistics about brain cancer in Australia here. Read more about DIPG or Diffuse Intrinsic Pontine Glioma. Symptoms may vary according to age and type of tumour. The Brain Tumour Charity UK has produced a guide to symptoms called HeadSmart. This provides detailed descriptions of symptoms by age bracket. Click here for HeadSmart. Steroids may also be given to decrease the swelling caused by the tumour. Your child may undergo some or all of these treatments, depending on their tumour type and grade, your child’s age, overall health and medical history, and your family preferences. Read more about the treatment options for brain cancer here. Cancer Australia Children's Cancers website offers advice and support for children living with cancer, their families, friends and their broader community. It provides information about clinical trials and research, as well as links to resources for health professionals and researchers. As with other tumors in both children and adults, surgery is the primary treatment, usually followed by radiation treatment and/or chemotherapy. Unfortunately, because your child's brain is still developing, these treatments can result in more substantial and permanent side effects than they would for an adult. Talk to your child’s medical team about their treatment options and what to expect. Not all brain tumours can be treated with surgery. Children with some inoperable low-grade tumours may be successfully treated with other therapies. But for children with diffuse tumours in the brainstem (for example, DIPG) surgical removal is not an option and other treatment options may be explored. Click here for information about a project Cure Brain Cancer funded relating to DIPG. If a child receives radiotherapy, it is given in a lower dose than is used for adults and is rarely used for children under the age of three. This is because it can slow physical growth and intellectual development. About 85% of children who have cancer participate in trials even though there are far fewer children than adults who are diagnosed with cancer. This has led to a great improvement in children’s survival rates because children have been able to access promising treatments, and the evidence for their effectiveness has been obtained quickly. Read more about clinical trials for brain cancer here. Search for clinical trials for children here and add the tumour type into the search criteria. Make sure you speak with your child’s medical team about eligibility for specific trials. A significant number of children with brain tumours will recover completely. Other children may have treatment that controls their tumour for many years. Today, more than half of all children diagnosed with a brain tumor will be cured of the disease. But with any cancer, prognosis and long-term survival varies greatly. Prompt medical attention and aggressive therapy are very important, as is continuous follow-up care. A number of organisations (both in Australia and internationally) offer practical and emotional support and services for families and children. Many offer specific advice on how to talk to your child in an age-appropriate way about their brain cancer. Cancer Australia Children's Cancers website offers advice and support for children living with cancer, their families, friends and their broader community as well as resources for health professionals and researchers. Read more about support for brain cancer here.